South Korea’s Hyundai Motor Co. facing a proxy war with Elliott Management Corp. over dividend policy in upcoming shareholders’ meeting has gained a vote of confidence from Glass Lewis & Co. , a prominent adviser to institutional players, in its spending plan on future growth instead of lavishing on major shareholders. 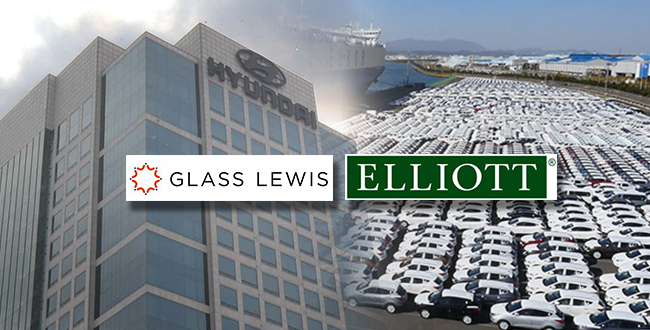 Glass Lewis in its advisory guideline for shareholders of Hyundai Motor recommended they vote down Elliott’s demand for cash dividend of 21,967 won ($19.5) per common share, or combined 4.5 trillion won in one-time reward for shareholders, citing the automaker’s rich case reserve, at the general meeting on March 22 according to sources from the auto industry. Glass Lewis is one of the world’s two most established proxy advisers with Institutional Shareholder Services (ISS). The proxy advisory firm also supported Hyundai Motor’s three candidates for independent directors and opposed to the nominees from Elliott. The New York-based hedge fund has been rounding up support for its proposal demanding Hyundai Motor to pay total 5.8 trillion won including preferred shares in one-time dividends, more than four times the car maker’s net profit last year. Hyundai Motor already rejected the proposal last month, and its board approved an annual payout worth 1.1 trillion won including preferred shares instead. The Korean car maker also pledged to jack up its research and development spending to 45.3 trillion won over the next five years, using retained capital, to obtain future car technologies and stay competitive. Market analysts said that the odds of Hyundai Motor winning against Elliott in a shareholder vote on the proposals have been raised, as many foreign investors are expected to follow recommendations of Glass Lewis. As of the end of 2018, the largest 29.11 percent stake in Hyundai Motor was held by family owners of Hyundai Motor Group and Hyundai Mobis Co. The National Pension Service is the second largest shareholder with a 8.70 percent stake, followed by U.S. Capital Group with 7.78 percent and Elliott with 3.00 percent. According to Korea Exchange, foreign shareholders own a combined 45.84 of Hyundai Motor.